First up, CK One Summer 2008 from Calvin Klein, a unisex fragrance developed by perfumer Harry Fremont and featuring notes of watermelon, watermint, hedione, cucumber, cardamom, moss, blonde woods and musk. Wait, I am confused, is Estee Lauder producing a lighter version of Pure White Linen in a summer bottle or is Pure White Linen termporarily available in a summer bottle? Pure White Linen Summer Breeze is a very nice fragrance so why do they have to add another one?! Yes to both: it is a lighter version of Pure White Linen, temporarily available in a summer bottle. They do this collection every year. Pure White Linen Summer Breeze is a different fragrance, here, same fragrance, lighter concentration. Not sure that was clear — by “here”, I mean, “the summer fun collection”. Yes I totally understand you. Maybe this lighter version has just less alcohol, like Jean Paul Gaulthier does each summer with his Classic. If the scent itself is lighter then there is hardly anything to smell. Maybe this is for S.E.Asia then.. Looked it up on their website and this is even another fragrance. Oh well..I have my mind set on the green one, the Breeze. One or two of those might be rather nice (she says generously!) but they're not the Guerlain AAs or the Kerala Hermes Jardin thingy. I called in on the City Hermes store on my way home the other evening as I wanted to cadge a sample of Osmanthe Yunnan and one of the SAs is nice and friendly. She said she'd smelled the new one but she was very enigmatic about it. Not spicy, she said, clean she said which slightly worried me but I'm banking on her just not giving too much away. Oh dear, hope it is not so bland as Paprika Brasil – I did not like that one. Congrats on finding a friendly Hermes SA! I find them very nice in New York, but the smaller suburban stores are often amazingly snotty. Right, Pure White Linen Light Breeze, not Pure White Linen Summer Breeze — ack, can't keep them all straight! Regarding the CK… the only edition I found truly different and yet very wearable was the CK one Electric.. People either love it or hate it… and I THINK I might still be able to snag a bottle somewhere..
FYI Robin, my perfume shopping has come to a screeching halt, at least until my birthday in april… I am moving in into my OTHER obsession, HiFi audio, renewing my rig for the first time in 10 years… So for now all I am doing is making LISTS of perfumes I'd like to buy…. or to give as gifts.. I'm a sucker for Issey, so I've been trying to get an advance bottle of the summer edition. I try them all, but nothing ever comes close to the carnation in the original EDP. Yet I keep trying every year. I love the original White Linen; the combination of green and aldehydes is classic to me. I haven't been able to get into the Pure and Breeze editions, too soft for me. They have the IM bottles at Bloomies. They always seem to get the IM summer scents before anybody else in the US. Any idea of what the JP Gaultier Summer edition will look like? What about Cacharel? Haven't seen either of those yet, but I'm sure they're coming, and we've also got summer stuff coming up from more of the usual suspects (Tommy Hilfiger, Carolina Herrera 212, etc). I just smelled the Issey yesterday. It may be that I'm still not up to scent-speed but it smelled pretty much exactly like the original Issey (and I used to wear that a lot so I'm pretty familiar with it). It's not bad but I'm not exactly sure what's really different about it. Maybe someone with a more advanced palate will be able to determine. Without facetiousness, what is a note of precious woods? You know, it just means there's some wood in there, seriously. I mean, they aren't going to say “cheapo synthetic wood smell”, right? They're going to say “precious” instead. Mind you, not saying there isn't any “real” wood as opposed to “synthetic” wood in any particular scent, but there isn't any way of knowing that from the list of notes anyway even if they're more specific and list actual kinds of wood like cedar or sandalwood or something. LOL — the original Issey is a pretty darned light scent. I doubt I'll be able to tell the difference either. There might not even be any difference, although I'd assume it is a lighter concentration, and it might be alcohol-free. 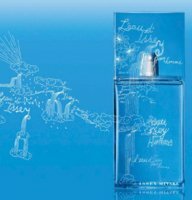 The L'Eau d'Issey Summer bottles are simply stunning. They did do a nice job this year.